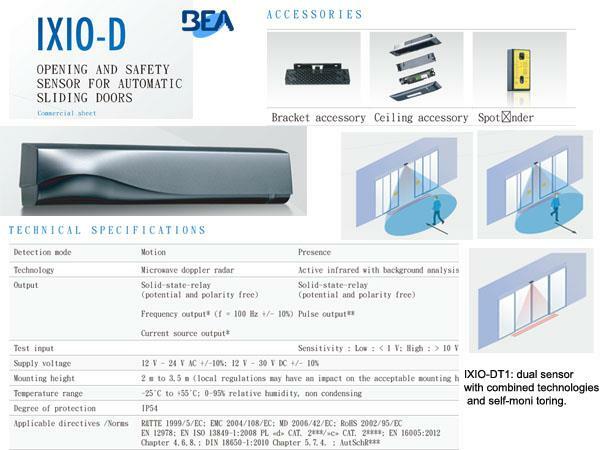 • Opening and safety of linear, telescopic and curved automatic sliding doors. • Intuitive con􀀀guration thanks to an LCD screen and/or a BEA remote control. • LCD graphics screen with choice of language. • 10 adjustment options for the IR curtains. • Lateral orientation from -15° to +15° for the radar antenna. • 4 infrared spotlights visible on the ground for the easy adjustment of the failsafe curtain. • Plug, push & go. • IXIO-DT1: dual sensor with combined technologies and self-moni toring. • IXIO-DT3: dual sensor with combined technologies for emergency doors and standard doors. 3-in-1 product with choice of 3 types of output (current/frequency/relay). • IXIO-DP1: dual sensor with combined technologies for pulsed safety door controllers.